Respecting our flag and our soldiers, shows that we are thankful for the freedom and protection that we have in America, living under God. Proudly waving our flag, with its stars and stripes, means that we want to live here, and live in peace with others who live here. Respecting our flag shows a love for our country, and the freedom for which it stands. Disrespect for our flag, shows disrespect for our soldiers and the sacrifices they make. Patriotism brings up the morale of our soldiers and their families. It shows we stand on a firm foundation and strong principles. 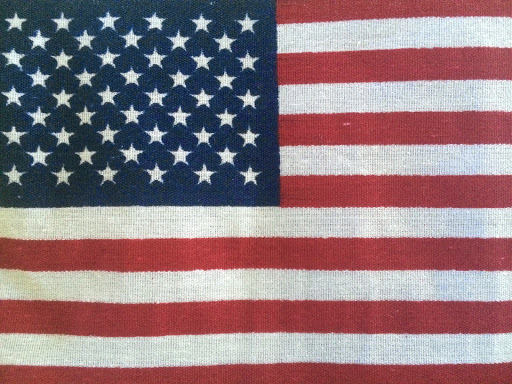 When I was a little kid, I proudly waved my miniature flag, which was attached, to a little wooden stick, with two small staples. I’d heard I should be careful to not drop the flag on the ground, and that a ruined flag was to be burned. Flags should not be worshipped. Instead, we should worship God, who watches over our country. We should show respect towards things that represent His authority. These things are: bibles, crosses, and our United States flag. As a small child, I lived on an American Air Force base, in Italy. Every evening, all play was momentarily stopped, as “Taps” was played. As little children, we knew to respect our country, even when we were living in another one. Men and women in uniform were commonplace. Saluting was the norm. There were soldiers at the commissary, getting food, and uniformed personnel shopping at the base exchange. They were everywhere. We knew they were protecting us. Our fathers were gone, months at a time, for training. Mothers took care of the extra work, during their absence. We picked up, and moved to a new country, every three years. Either by leaving first, or being left behind, we felt the loss of fond family and friends. There are sacrifices for freedom, and the biggest sacrifices come when soldiers go to war and die. It’s a great privilege to live in the United States of America, and many lives have been lost, in order for us to be able to live here. Our American soldiers have died, and are still dying, so that we can live free, in the United States. Many lives have been lost, so we can live in freedom. The silver lining is that through Jesus, we can be forever free, with no more fear, tears, or pain. Because God gave His son, Jesus, as the ultimate sacrifice, we can look forward to Heaven. In Heaven, we will be whole, with new bodies, reunited with loved ones who have given their lives. The final victory, comes when we win the battle, and go home to be with Jesus. We receive the gift of salvation, by admitting we are sinners, recognizing Jesus Christ died for our sins, and inviting him into our hearts.